Dubspot contributor Michael Emenau investigates the deep and ongoing influence of Ann Arbour producer Dabrye’s seminal One/Three album. In high school, Tadd played in a variety of punk and indie rock bands, but in 1995 after hearing Aphex Twin, he was inspired to pursue a solo career as a DJ and electronic music producer. One/Three, Daybre’s first full-length release, immediately established him as a unique force in the ever widening world of hip hop. One/Three rides a wave of abstract hip hop and funked up beats. The lack of vocals leaves the production beautifully exposed and full of surprises. What makes this album so interesting to me is the continuous subtle alterations in the rhythm of both the drum programming and melodic content. For a hip hop producer, the challenge is often the very stylized conventions of the genre. The beats are repetitive, the phrases are broken into neat eight and sixteen-bar sections, and syncopation is used sparingly. The focus is on the MCs, giving them space to do their thing. If the production is too complex, it distracts the listener from what the MC is trying to say, and does a disservice to the overall track. Dabrye messes with form constantly: dropping beats, shortening phrases, offsetting snare hits, and using odd-length melodic phrases. Amazingly, the pulse is never lost and the grooves are tight, but they mess with your head just enough to make you return for repeated listenings. Mullinix has found the perfect balance between consistency and variation. At 0:28 in “Hot Mating Ritual,” the kick and snare shift over one beat, while the other tracks remain the same–subtle yet wonderful. Listen to the constant shifting length of the melody. The phrase seems to always start on beat one, but the ending never seems consistent. When the melody repeats, it feels delayed or pushed. The drums are super solid, but when you listen closely, you’ll notice that the drum pattern switches from being four or eight beats to being six beats long. Again, this time shifting is very subtle and does not affect the bigger picture. The music grooves, but the constant rhythmic ear candy makes me want to listen again and again. The displacement and constant evolution of the acid lead line on “So Scientific” again shows how subtle alterations can change a track from being merely cool, into being truly memorable. So, how did Daybre make these tracks? 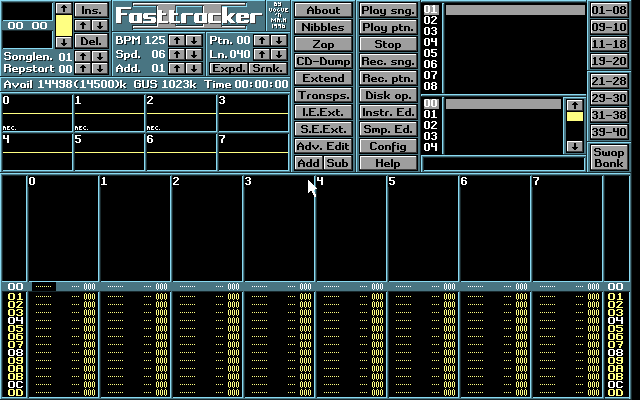 What you may find crazy is that they were not made with samplers or standard MIDI sequencers, but a (now ancient) shareware tracker program called AST. In working with this program he discovered something that many producers feel is the heart of the creative process: working within a set of limitations. Pushing against limitations forces you focus your energy, and helps you to get better results than trying to learn everything that is out there. Focus on making music, not on learning how to use hundreds of devices–this is how you will discover your own sound. Dabrye is very focused on the feel of the drums. The drums are always up front and strong in the mix, and he’s not afraid of going outside the bounds of the quantized rhythms. Often, the snares hits are placed far behind the beat, to create a very laid back, almost drunken feel in the groove. The pulse moves forward but the groove pulls us back. There is a merging of grooves, combining the laid back beats common in hip hop, with the more quantized and “on top of the beat” programming in house music. The electronica pushes you forward while the hip hop pulls you back. Here is a video of someone trying to recreate the drum programming of “Hyped-Up Plus Tax” in Ableton Live. This is rather geeky, but you can see just how off-kilter the beat is when looked at in a grid. Dabrye and his contemporary Prefuse 73 were on the forefront of merging of hip hop with electronica, using laid back, rhythm-bending grooves. Check out this Prefuse 73′s One Word Extinguisher (Warp 2003). This was released two years after Dabrye’s One/Three, but it really solidified and gave validation to Dabrye’s groundbreaking work. These two producers were unknowingly having a big impact on a new scene that was brewing in LA. These pushing and pulling rhythms were not going unnoticed–many of the young producers now part of the Los Angeles “beat scene” were emulating this swaggering, drunken feel. The glitch hop movement was underway. With the event Low End Theory as their home base, producers such as The Glitch Mob, Daedelus, Nosaj Thing, and Flying Lotus were coming into their own. Dabrye’s One/Three, like so many seminal albums, had one foot in the past and the other looking forward. You can pick up this classic recording at Ghostly.com, along with other releases by Tadd Millinix. Note: All quotes used in this article are from a 2007 interview at the Red Bull Music Academy in Toronto. Michael Emenau a.k.a. MNO has worked professionally as a musician (vibraphone, percussion, laptop), producer, remixer and arranger for 25 years, playing such diverse genres as, jazz, rock, drum’n’bass, salsa, techno, country, Hindustani, gospel, baroque and orchestral music. He has recorded on over 150 CDs, composed music for eight films, toured internationally, and lived on three continents. Michael was the house studio mallet percussionist for Sony Records (Japan) in the 90s, was a founding member of the award winning “Jazz Mafia” as well as working as a producer/remixer for Six Degrees Records in San Francisco, arranged and produced contemporary multimedia productions of the 16th-century composer Henry Purcell in Paris and is now writing a musical based on the life of Dionysus and dividing his time between Montreal and New York.